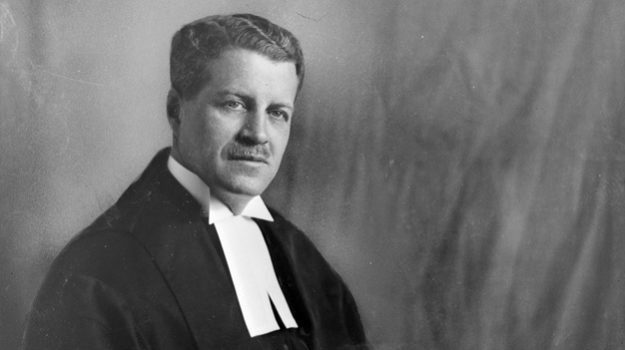 Gérald Fauteux was active in the Canadian Bar Association and, later in his career, was appointed to the Supreme Court of Canada. He also had close ties to John Humphrey, who helped draft the United Nations Universal Declaration of Human Rights. In the Padlock case, Fauteux, who supported the decision to quash the legislation, argued the following: “Bref, la loi incriminée prohibe et punit la propagande communiste par la perte temporaire d’un droit – celui de la liberté ou de la propriété – et non par la perte d’un privilège” (Switzman v. Elbling,  S.C.R. 285 at 319). “Joseph Honoré Gérald Fauteux was born in Saint-Hyacinthe, Quebec, on October 22, 1900. He was the son of Homère Fauteux and Héva Mercier. He studied at the University of Montreal and graduated with an LL.L. in 1925. Called to the bar that year, he settled in Montreal, where he practised with his grandfather, Honoré Mercier, forming the law firm of Mercier & Fauteux. From 1930 to 1936, he was Crown Prosecutor for Montreal, and in 1939 he became Chief Crown Prosecutor of the province of Quebec. In 1946 he was associated with the Royal Commission on Spying Activities in Canada, acting as a legal adviser. For 14 years, he taught criminal law as a sessional lecturer at McGill University and was dean of the Faculty of Law from 1949 to 1950. He was appointed to the Superior Court of Quebec in 1947 and to the Supreme Court of Canada on December 22, 1949. He was also one of the founders of the Faculty of Law of the University of Ottawa, serving as dean from 1953 to 1962. On March 23, 1970, he was named Chief Justice of Canada. He served on the Supreme Court for 24 years, retiring on December 23, 1973. Chief Justice Fauteux died on September 14, 1980, at the age of 79” (Supreme Court of Canada, “The Right Honourable Joseph Honoré Gérald Fauteux, www.scc-csc.ca).